In a day and age when some young women in funeral service pattern themselves after kooks, here’s a real role model. Several months ago, I participated in a home funeral. It was my first, and it all worked beautifully. Any funeral director will tell you that they would be glad to accommodate a family in this way, if possible. One does not need a specialized funeral home, as suggested by the article. What isn’t being said, however, is that few families express an interest in such a service, and even fewer follow through. In one of the most touching articles we’ve ever read, a mother pens a heartfelt thank you to the funeral director who handled the funeral of her 11-year-old daughter. The author of this article, Colin Brazier, a recent widower, makes many salient points about loss, grieving and the role of the funeral. He emailed friends and family, reminding them that they would be attending a funeral, not a party, and requesting that in dress and demeanor they respect the occasion. “It’s unfair on children to insist that a funeral should mean rejoicing in a life now passed. Maybe grown-ups can handle the cognitive dissonance required in ‘celebrating’ a life rather than, you know, being all morbid. But I seriously doubt children can,” he wrote incisively. His statement that “wearing black gives people licence to be lachrymose,” is a powerful one. There was a time that those in mourning were recognizable by their mode of dress, and treated kindly, gently and with understanding. These days, those in mourning are rarely recognized. Mr. Brazier has written the best piece in eons on the subject of funerals. Unlike the inane articles we’re being fed lately by the media, written by those who death has yet not touched, Brazier wrote with heart, emotion, and from a perspective of deep and painful loss. For the record, I am a graduate of American Academy-McAllister Institute, and the black eye on the school’s reputation saddens me. I have only met Meg Dunn once or twice in passing, but I do know a number of the students whose licenses are in jeopardy. Unfortunately, they were afraid to be quoted in this article for fear of retribution. Their choices going forward are minimal: retake the National Boards in June, or get an extension until December, if willing to sign certain rights away. My hope is that this situation gets resolved ASAP so that these students can regain their peace of mind, and work in their chosen field without this cloud of uncertainty hanging over their heads. Dare I say, here we go again…. Why not just make a template of this article and pass it to every journalist in the country. What would be way more interesting is if writers understood that while women might outnumber men in mortuary schools, that does not necessarily translate into actual employment. More fluff. “Mortuary makeup artists,” lol. Those who apply cosmetics to the deceased are called funeral directors. 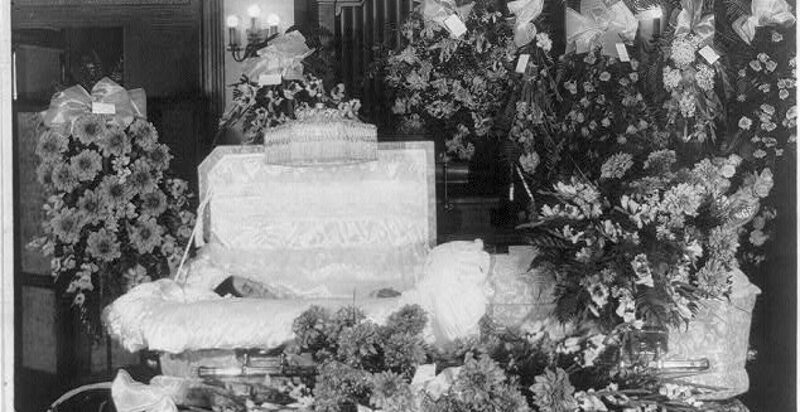 The spate of articles professing that women are new, and a novelty, in funeral service has become tiresome. Girls, get over yourselves. If you study the history of funeral service, you’ll find that you are not special. Female funeral directors haven’t been a novelty since, oh, about 1978. Here we go again —-women as novelties in funeral service. For the umpteenth time, they are not. The AP line about persistent stereotypes includes “women not being strong enough to lift coffins (you mean caskets).” News flash: some are not strong enough. Nor are some men. That male funeral directors don’t want to hire women is a “staggering issue that women face in this industry,” according to one of the young women interviewed. She added her qualms about the residency period “which is a long-term internship for a year to get your license…” An entire year’s commitment, imagine that! It must have been a very slow news day when this was published. What’s more, much of the content is unintendedly hilarious, and woefully inaccurate. Ms. Bowser, who claims to have an “old soul” was inspired, in part, to become a funeral director by “her love of classic horror movies, such as ‘Night of the Living Dead.’ “What better motivation to become a funeral director!? (Not!) The article goes on to say that “unlike many of her peers, Bowser didn’t inherit her mortuary career from a parent.” With so many corporate takeovers of family-owed funeral homes in the past two decades, that’s rarely the case. Ms. Henry, too, has questionable career motivation. She tells the reporter that her favorite toy growing up was a “bobblehead doll of Hades,” the god of the underworld in Greek mythology. She also wants to —wait for it– “bring more transparency to the field, since it’s seen as taboo and morose.” Taboo? I don’t think so. Morose? Perhaps. “But it’s just another aspect of life that we all, as human beings, go through,” she continued. Only someone too young to feel their own mortality could make such a statement. Henry also wants to give educational seminars on preparing for a funeral (why haven’t the thousands of funeral directors before her ever thought of doing that !? Oh, they have! ), and she wants “to help people who fear the inevitable.” In fact, she believes that “talking about death can help those who are scared feel more comfortable.” (Sure, that will work.) In fact, try that with someone who has just been given a life-threatening diagnosis, and see how receptive they are. She also wants to be on TED Talks, podcasts and YouTube channels. You got it folks, she wants to be a social media celebrity, and sees funeral service as her vehicle. One of the “deathcare startups,” profiled in this article wants to shoot your cremains into space (well, actually 15 miles above earth), at a starting price of $4,500. The other incorporates them into custom-made bullets. After a spate of school shootings, could there be anything more inappropriate!? “Where else can you go and have a pint of fresh beer and watch machines make diamonds out of dead people?” asks the co-owner of LifeGem. The title alone of this judgmental piece is appalling. It derides each and every family that has chosen to honor their loved one in the time honored tradition that we know as a funeral. “A typical funeral service today is remarkably similar to one from 50 years ago,” states this pointless article. And the reason is simple: it has served mourners well all these years. The article also says that a site called Parting.com is “trying to demystify the process of finding a funeral home.” For generations, people have turned to their tried and true family funeral director. No mystery there. And once again, as is a commonality in these silly articles, those quoted are on the fringe, with little actual experience. This article is actually old nonsense, but was only recently brought to our attention. Apart from the headline which insults anyone and everyone who opts for a traditional funeral, this article is chock full of misinformation. Case in point: the writer’s perception that all caskets are “buried within steel vaults and reinforced concrete.” It may have been helpful to interview someone other than the owner of a green burial ground (who, of course, is touting the benefit), and an inexperienced funeral director. Perhaps the most amusing line in the piece (and there were many) is this: “Indeed, many are finding that green burials provide a level of complex emotional satisfaction that traditional funeral services usually can’t. ” Say what!? Good assortment for those who like what they do and to see the other side weird or not. We all to agree and disagree. No longer is there a cookie cutter way of doing funerals. Keep posting these, some we will pass by, others articles will connect with us.